Small businesses or someone looking for a blank canvas to do a custom conversion will take delight that the Ford Transit Connect may just be the ticket. 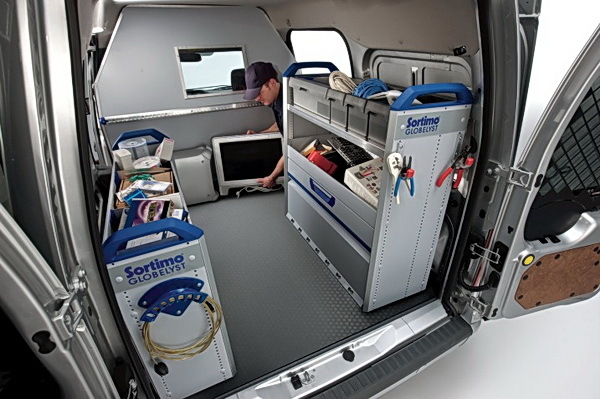 The fullsize van has been lost in obscurity from many carmaker’s product line up and the Transit Connect is a keen replacement. Boasting a roomy interior that is ripe for customizing towards professional services that need to be mobile, the Transit Connect is a versatile work mule that is compact and economical. After relying on full-size E-series vans for commercial cargo carrying since the dawn of time, Ford is finally ready to offer North American businesses a more practical alternative. 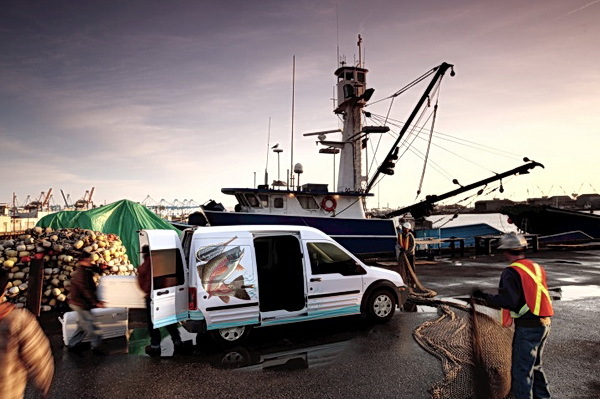 The Transit Connect is a compact, purpose-built van that’s been available overseas since 2002, and Ford has sold more than 600,000 of the squat little haulers, with 135.3 cubic feet of cargo space, to businesses abroad over the past seven years. 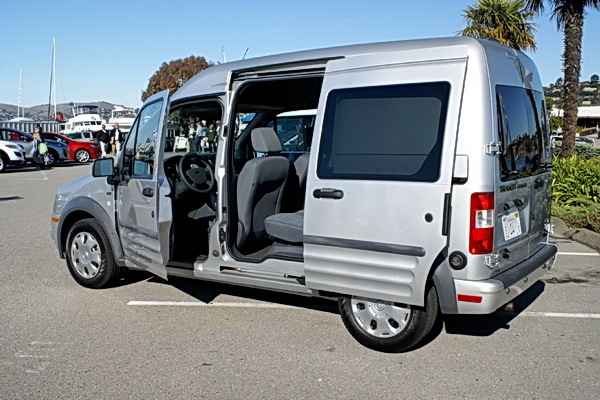 Base price for a Transit Connect van starts at $20,780 and is still pretty affordable for the top-of-the-line model that has glass instead of steel panels. A 2.0-liter four-cylinder engine putting out 136 hp and 128 lb-ft of torque sends power to the front wheels through a 4-speed automatic transmission. According to Ford, since the Transit Connect is designed primarily for urban markets, the lower gear ratios are the ones that will be used most often and Ford wants to keep the price of entry down to appeal to small businesses. Smaller and more economical than a Dodge Sprinter, the Ford Transit Connect won’t put a dent into small business budgets. With very respectable numbers from the EPA, 22 mpg in the city and 25 mpg on the highway, the Transit Connect is not a pup thirsty for gas. A year from now, Ford will start offering a fully electric version with a choice of two lithium ion battery sizes: the 21 kWh pack will give a range of about 60 miles, while a 28 kWh pack should push the Transit Connect for about 100 miles. The Transit Connect was specifically developed as a commercial vehicle. It has a beefier chassis designed to withstand the rigors of daily business use and Ford has a different testing regime for its commercial and consumer vehicles. 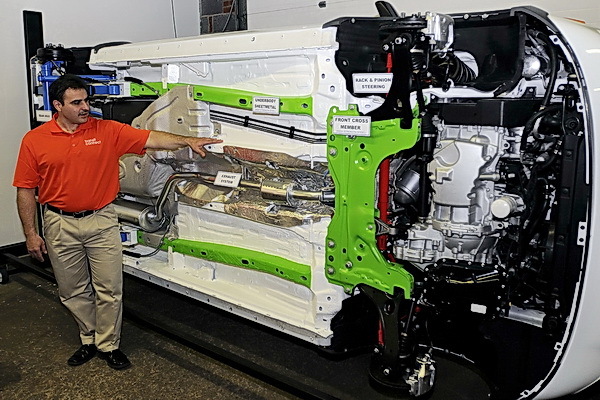 With a high strength steel front cross-member and extra side cross-members, the Transit Connect endured Ford’s rigid durability testing and walked away unscathed. It’s a stout runabout and a testament to Ford’s engineering abilities. Although the TC does not share a platform with any of FoMoCo’s cars, its layout is more car-like than truck-like, which pays dividends in the driving department. Our brief time behind the wheel didn’t give us an opportunity to flog the Transit Connect within an inch of its life, but the steering wheel — adjustable for both reach and angle — was reasonably well weighted and provided adequate feedback. The floor is low and flat, allowing parcels to be loaded with ease while keeping the center of gravity closer to the ground. In our relatively unladen tester, there was remarkably little body roll when cornering. Reasonable handling is universal these days and the Transit Connect doesn’t have the potential to scare anyone. However, until we can get behind the wheel when fully loaded down with cargo, we’ll reserve judgment on it’s ability to simultaneously scoot and haul. The TC has a load capacity of 1,600 lbs. Supporting that much weight requires fairly rigid springs, so the ride is on the stiff side, particularly when rolling freight-free. However, it’s not uncomfortably harsh and the damping is set perfectly to keep the body from bouncing around, but a Benz it is not. Over uneven patches of pavement, occupants will definitely feel the ruts and divots, but it’s still remarkably more pleasant than driving your run-of-the-mill full-size pickup. For a small business, or maybe a large business with a need for small transporters, the Transit Connect is an enticing offering. A low load floor and split rear cargo doors – opening at a standard 180 degrees or an optional 255 – ease loading and deliveries alike. The TC is suited for professional service and can be outfitted with any number of different shelving/storage solutions by various independent conversion outfits. Also of some interest to businesses is the suite of Ford Works Solutions gadgets. They include an in-dash computer ($1,395) with Internet access, a navigation system and a Bluetooth keyboard and printer, for printing invoices and such. Separately offered is Tool Link ($1,220), which uses a radio frequency ID system to scan the contents of the vehicle and report what tools/supplies are inside the vehicle at any given time. Thankfully, Ford is recognizing the need for more compact and economical vehicles, such as the Transit Connect, the fiesty sub-compact Fiesta, the European model Focus, and making those models available in America. We found the Transit Connect to be a capable and versatile performer that could fulfill the needs of a small and mobile business or even large businesses that require compact mobile solutions. I just purchased a 2011 TC XLT Premium (with windows all the way around). It is the single best purchase I have ever made. $25 grand for a fully loaded vehicle with more head room than anything short of a bicycle LOL!!! Heck I even have heated mirrors, a tow package, and a remote start. The only thing that I can say that’s bad are the fugly hub caps… If ford can put a sharp package like this together, why can’t they offer something more than 1970ish very cheap looking plastic hub caps? Everywhere I go people tell me they love it and are amazed that I average 24 mpg. If anyone knows where I can find some nice wheels for it, I would be most appreciative. I need one that is long range battery powered. No more oil changes and no more ignition problems like I’ve had with my current Ford. I don’t have time to be at the dealership repair shop all the time. Time is money. I am thrilled I found this vehicle yesterday at a dealership. I drive an econo, large, older ford van. I am getting tired of the cost of gas. As a taller woman, I love the headroom and will consider this as a more comfortable choice than a dreaded Minivan. We own both an extended Sprinter conversion and a TC in the process of being converted–they are our everyday transportation and “playmobiles”. When it comes to gas mileage on these specialty vehicles, well, we definitely can’t complain. (Could you imagine driving a Winnebago to work everyday? For camper conversions, http://kevinhornbydesigns.com does conversions and has some great ideas on the site. ALL Wheel drive with Diesel or a hybrid six cylinder would be an obvious improvement. Not sure why there are not more vehicles out there manufactured commercially that would suit the needs of outdoor enthusiasts without custom conversion. Seems like there is an obvious market. Hint Hint Ford Dodge or Toyota ! I saw a Transit at Circle K (convenience store) with United Blood Bank graphic. I waited for the driver to come out. He was obliging, opened the van for me to look at inside, & answered my questions. United Blook Bank here in Phoenix has purchased a fleet of these vehicle. I, too, am interested in a camper conversion as I immediately realized the size, shape & capacity would be just perfect for me to take to the trailhead, sleep in overnight, & start my hike early in the morning. I Agree With Photo John! The Transit connect is brilliant. However I’d love to see a AWD Camper version of this for people like me that want an economical/small van for camping that can handle icy/snowy roads. Business owners rejoice here is a vehicle to keep your bottom line in check.Now we need the Diesel and Electric versions .They make several more models in different sizes.Ford is heating up big time. Great review on the TC. If your audience visits http://www.fordvehicles.com/transitconnect/ they can see how others have customized it and available accessories/Cargo management systems. and at 1/2 the price of a Sprinter (which I also considered) that’s a hell of a bargain! Good article, guys! I’ve seen a couple of these mini-Sprinters and I think they’re really interesting. I’d love to see an article on different kinds of conversions – in particular camper conversions for outdoor enthusiasts. I have a pro photographer friend who has a Sprinter outfitted for shooting bike events. He lives out of it, processes photos on computers in it, and carries bikes. It’s sweet but it’s kind big. What I’d really like to see is a diesel Ford Transit Connect with more power and all-wheel drive. That would be sweet!